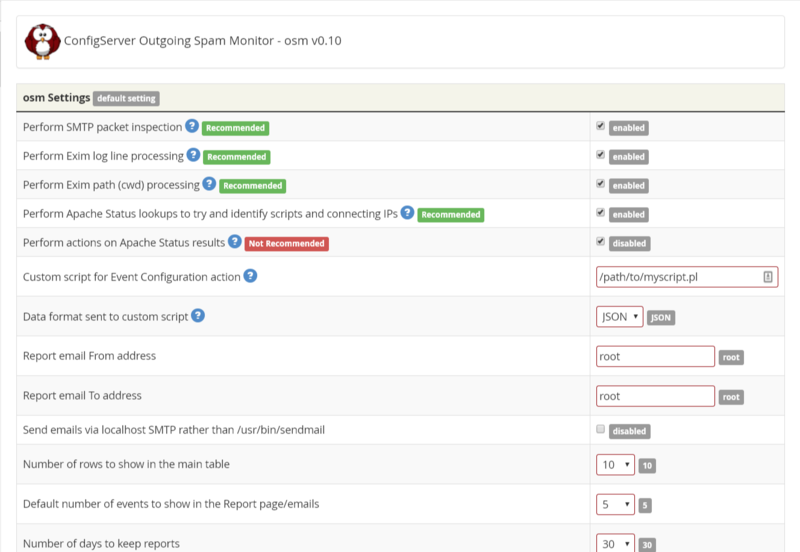 ConfigServer Outgoing Spam Monitor (osm) has been designed to use multiple methods to monitor outgoing email and SMTP connections for activity that could indicate a spammer is active on a server. With the proliferation of web scripts in shared hosting environments that are often poorly maintained or badly written, the chances of a hacker exploiting vulnerabilities in scripts is at an all time high. Additionally, end-user PC’s and other devices that send email through a server (relay) that have been compromised and used as a spam source has always been a problem. These issues along with spammers deliberately targeting hosting providers by purchasing accounts simply to send out spam have kept the diligence required to prevent spam from being sent from servers all the more difficult. osm is for any server owner using cPanel that is concerned about future or active attempts to send out spam email through the server. 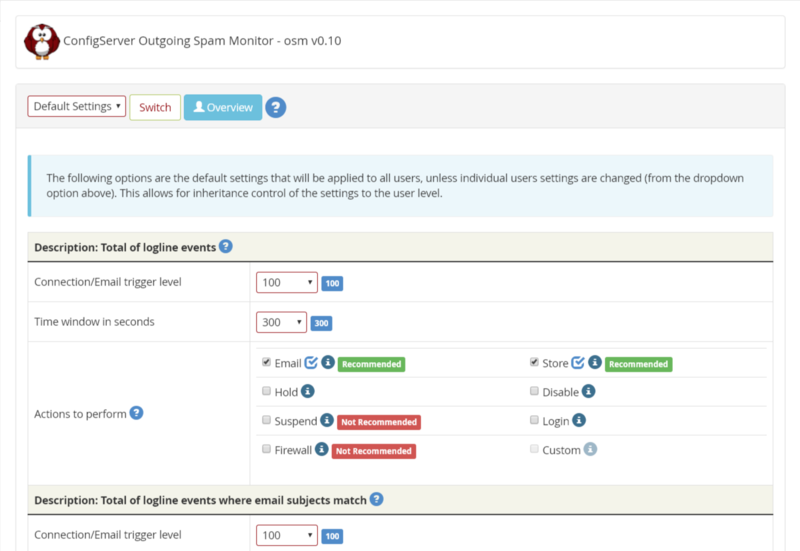 osm targets all the methods available to keep track of outgoing email and SMTP connections. 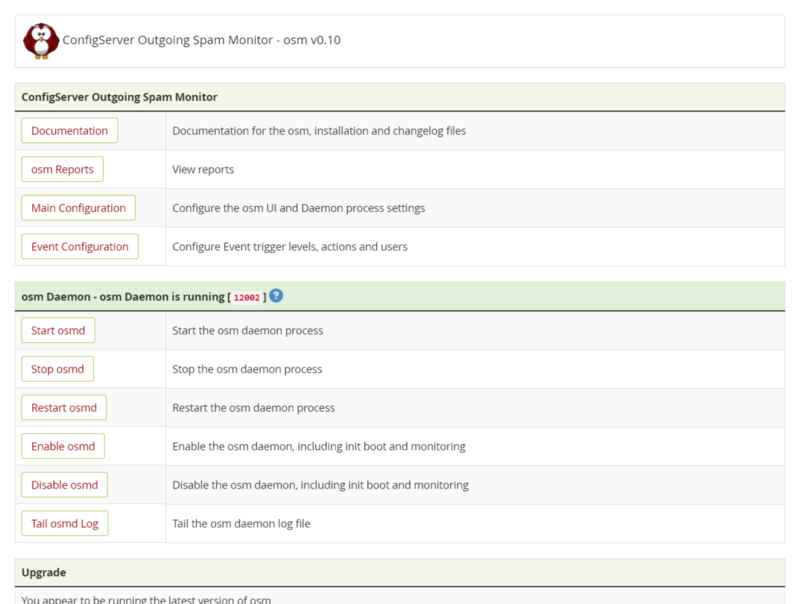 osm is designed to be used entirely from the cPanel WHM UI, which provides both configuration and viewing of reports generated by a daemon process running continuously on the server. For more information about osm, please visit the product page. As mentioned in our previous posting, osm is nearing release and has now entered beta testing. We have put up a web page outlining our new product. …we would like to hear from you. We have limited slots available for beta testers who will get a single free license of osm once beta testing has completed. If you would like to help, please log a ticket on our helpdesk with a cPanel server IP address and we will provide further information.